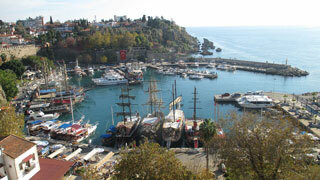 Antalya was first settled around 200 BC by the Attalid dynasty of Pergamon, which was soon subdued by the Romans. Roman rule saw Antalya thrive, including the construction of several new monuments, such as Hadrian's Gate, and the proliferation of neighboring cities. The city has changed hands several times, including to the Byzantine Empire in 1207 and an expanding Ottoman Empire in 1391. This article uses material from the Wikipedia article "Antalya", which is released under the Creative Commons Attribution-Share-Alike 3.0 License.